Just Mobile has a fascinating collection of accessories for portable devices that they view as "design objects." These include stands and chargers and styluses. The Just Mobile Slide is a beautiful example of this approach -- simple, elegant, and functional. The Slide is a stand for your iPad, striped to basics. It's made from a single piece of high-grade aluminum, with a cylindrical support at one end, which flows into a flat surface, with a lip at the other end to hold your tablet. The magic comes from a rubber cylinder stowed in the tubular support, which you pull out and roll down the surface to position your iPad at the desired viewing angle. The base is only around 5 x 3 1/2 inches, but with the solid metal construction and friction from the rubber cylinder it can hold the iPad firmly, and in both portrait and landscape positions. The Slide is indeed a crafted design object, and is available for around $34. Fingers are great for sliding and flicking and picking, but when you want to do some more extensive or precise work (or really go to town in Draw Something), a stylus can be a real help. But the stylus needs to be comfortable to hold and manipulate -- not too small or light or slippery. So Just Mobile has another interesting and elegant design idea to offer (see previous post) -- the Just Mobile AluPen Pro Stylus & Pen. 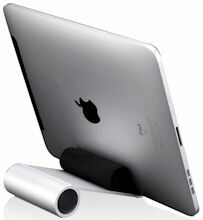 The AluPen is made from aluminum, with a soft rubber stylus for the iPad and other capacitive touch screens. Its chunky design provides the bulk to hold comfortably and securely, like a solid pen. The AluPen stylus is available in a range of bright colors for around $18. Or the AluPen Pro is a combination stylus and pen, including a retractable Pelikan ballpoint with twist mechanism for around $36 in silver or black. After all, you don't always need a stylus when using your iPad, but when you do, doesn't it make sense to use a special tool for the job? The Streaming Media East conference is back in New York for the 2012 edition. It's held at the New York Hilton Hotel in the heart of the city (6th Ave. between West 53rd and 54th Streets). While there's lots going on -- this year's show has some 100 speakers in up to four parallel sessions, and 50 exhibitors -- at the same time there's also time to chat with other few thousand attendees, as well as the speakers and exhibitors. The show kicks off on Monday with half-day pre-conference Seminars, on Streaming Delivery, Live Webcasting, Online Video Deployment for HTML5 and Flash, and Jan Ozer's annual update on Encoding for Flash, Mobile, and HTML5. As a bonus, several of the presentations are already posted online. The main Streaming Media East conference then runs for two days on Tuesday and Wednesday, May 15 and 16. The technical program opens with a keynote by Matt Frost, Senior Business Product Manager for Google Chrome. The presentations and panel sessions range from technical (HTML5, Flash, MPEG DASH, live streaming, encoding, video quality) to strategic (YouTube, Facebook, and social media, Internet TV, enterprise to higher ed). 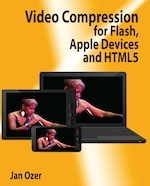 On Tuesday, conference organizer Dan Rayburn from StreamingMedia.com will compare and demo connected TV platforms, and Jan Ozer is back to help with Encoding Video for HTML5 (see post and book from last year). And the exhibits are open as usual on Tuesday from 10 am to 6 pm and on Wednesday from 10 am to 4 pm. This is a great opportunity to spend time with a broad range of the key players in streaming production and delivery. Yurbuds makes "Performance Fit Sport Earphones," with product packaging featuring sweaty triathloners. In particular, the bright red Yurbuds Ironman Inspire PRO earphones are definitely not low profile, with a rather bulky and ungainly look featuring a swoop design that twists into your ear. While at first glance this design might make sense only to help hold the earbuds secure for active use, the Yurbuds turn out to be amazing comfortable for extended wear, and with bright and clear sound. They're made from medical grade silicon that's rugged but flexible, with an extended 4 foot Kevlar cable, and are water-resistant and sweat proof. Plus they include an in-line microphone and three control buttons, so you can adjust the volume, start and stop music, and switch to hands-free calls. 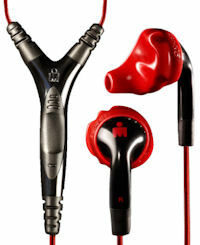 You insert the Yurbuds with a twisting motion to fit the scoop into the ear canal. It then rests comfortably and fits securely without requiring a tight fit, and still allowing ambient noise in from your surroundings. The scoop delivers clear sound deeper into your ears, for clearer playback and very clear phone calls, although it's a bit disconcerting to apparently hear the other party speaking so crisply from the center of your head. The Yurbuds are also great for listening to podcasts, although the clear sound does mean you hear more of the background sounds during less well-produced recordings. The bottom line is that the Yurbuds Ironman Inspire PRO Earphones are a great fit for sports, and beyond, combining a rugged design and secure fit with great acoustics and surprising comfort. They're available for around $49, along with other related models. Entries posted to Manifest Tech Blog in May 2012, listed from oldest to newest.